The website launch for this month is artofdancemarkham.com. 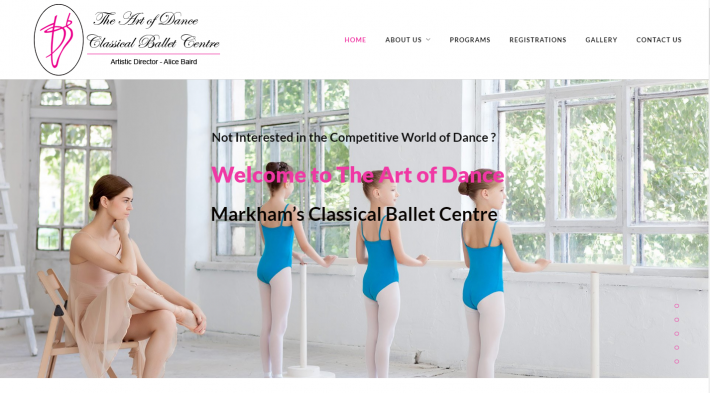 Art of Dance Markham is a private ballet school located in Markham where students start at a young age and grow into professional ballet dancers. The client approached ESimplified to develop a brand new website for their school. Keeping the client’s business in mind, we kept the colors on the lighter side with soft pastel pink to keep the brand colors consistent. Keeping simplicity in mind as well as functionality, the website has high readability with a very clear font, a menu that is easy to navigate through and a gallery on the homepage that gives the online user a good understanding of the ballet school. We had a very positive working relationship with Alice Baird – the owner and principal of Art of Dance, with our information gathering, planning, design & developing, testing & delivery stages to end up with a website which is pleasing to the eyes, easy to sail through and satisfying to the client. ESimplified has been honoured to work with Alice Baird and wish her the very best of luck. We look forward to working with her on future projects as well.